Wells was working on a different timescale than we now know to be the case, but we track his protagonist in leaps of a thousand years each as he moves into the future, “…drawn on by the mystery of the earth’s fate, watching with a strange fascination the sun grow larger and duller in the westward sky…” He catches the transit of a planet across the swollen Sun but doesn’t know which it is — so distorted appears the Solar System in the sky above that he wonders if Mercury is not near the Earth in this era, an inner planet imperiled by its own monstrous star. It’s lively stuff, and demands translation into our current understanding of stellar evolution: What does happen to our system’s planets when the Sun expands to red giant stage? One way of looking into this is to see what we can find around white dwarf stars, the ultimate destinations of stars in the Sun’s mass range after the red giant era ends. At this point, our star will have lost its outer layers, leaving only a comparatively tiny, dense core. Back in 2015, Andrew Vanderburg (Harvard-Smithsonian Center for Astrophysics) and colleagues published their findings about the white dwarf WD 1145+017, located in Virgo about 570 light years from Earth. The researchers were working with data from the rejuvenated K2 mission, which revealed that light from the star was periodically dimmed by a series of objects. The rocky bodies responsible were, the paper suggested, disintegrating, leaving traces of calcium, iron and aluminium on the white dwarf’s surface. 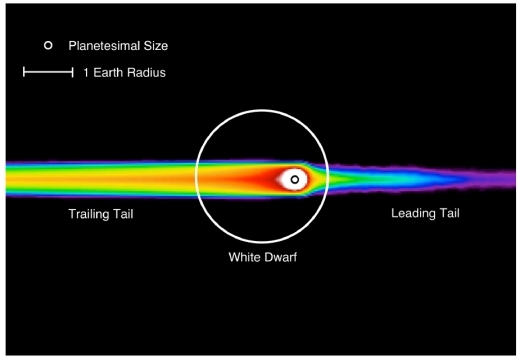 Image: A schematic of the trailing and leading cometary tails from the disintegrating planetesimal compared to the White Dwarf host size. Figure from Vanderburg et al. (2015). Now we have further insights into the same star from a team led by Paula Izquierdo of the University of La Laguna, Spain, who went to work on the white dwarf using the Gran Telescopio Canarias (GTC) and the Liverpool Telescope (LT). The method was fast optical spectrophotometry and photometry, analyzing the acquired spectra as a function of wavelength. With data from both telescopes, the objects around WD 1145+017 have been captured making two deep transits. We note in passing that the six times of transit minimum are roughly equally spaced in time, with an average separation of 6.2±1.1 min. The nearly equal spacing of these bodies is reminiscent of the string of fragments of comet Shoemaker-Levy 9 (Weaver et al. 1994). The famous ‘string of pearls’ comet may thus have an analogue around a distant white dwarf, or else, says the paper, we are seeing evidence of a dense debris cloud, or multiple clouds, extending 120° in azimuth. The authors find that WD 1145+017 has a mass of 0.63 ± 0.05 Solar masses and a cooling age of 224 million years, plus or minus 30 Myr. The ‘cooling age’ is a reference to the white dwarf’s age as a degenerate star; it does not, in other words, include its long span as a main sequence star and the red giant phase that would have followed it. 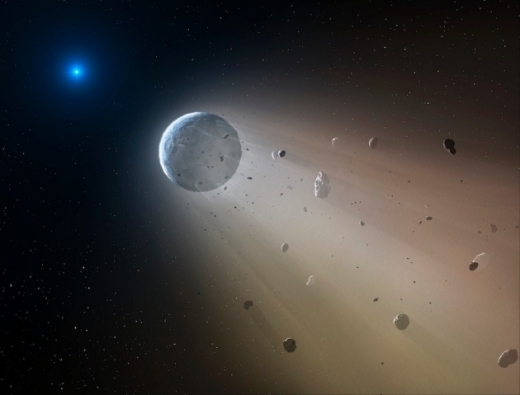 Image: The K2 mission spotted a disintegrating planet swirling around a white dwarf star. Credit: Mark Garlick. The decrease in the strength of the circumstellar line provides no information on the relative location of gas and dust along the line-of-sight towards the white dwarf. Time-resolved spectroscopy with a higher signal-to-noise ratio has the potential to provide further insight into the geometry of the gas and dust within WD 1145+017. The paper is Izquierdo et al., “Fast spectrophotometry of WD 1145+017,” Monthly Notices of the Royal Astronomical Society (24 August 2018). Abstract. The Vanderberg paper is “A disintegrating minor planet transiting a white dwarf,” Nature 526 (22 October 2015) 546-549 (abstract). In case you don’t have access behind the paywalls, the Izquierdo et al. paper is available on the arXiv here, while the Vanderburg et al. paper is here. Thanks for those URLs, Andy. I usually try to post the arXiv preprints but neglected to in this case. I know the chances are very low, but I cant help but think that one day we might get lucky observing a monotransit of a surviving giant planet around a white dwarf. Of course it would be a 100% occultation! Who knows, maybe if TESS outlasts its prime mission it might find one – would that be cool – a new exotic beast to add to the zoo. Correct me if I am wrong, but we tend to think of rocky planets as teh ones burned up during the red giant stage, with the gas giants relatively unscathed. However, we now know that there are “hot Jupiters” and “Neptunes” in close orbits around stars. What is the result of these types of worlds when a star settles into a white dwarf? What type of new minerals from their cores will be exposed once their atmospheres are stripped? A hot Jupiter with heavy metal oxides in the atmosphere will have what types of minerals in its resulting core? If a core is made of metallic hydrogen, what happens when it is exposed – does it boil away or remain in some dense state? Similarly with diamonds in Neptune-like worlds. Plugging into planetary physical principles, we know the core of a gas giant can’t be metallic hydrogen due to it being the lightest gas which needs a lot of gravity to hold it to a planetary body. Gas giants have to start out with a gravity strong enough to hold the hydrogen otherwise it will escape and not hold together. Consequently a gas giant near a star had to form very quickly or migrate to a closer distance from the star. Thank you for the comment. To clarify, you are saying that a hot Jupiter could have a metallic hydrogen core if it migrated inwards from the outer system, but not if it formed in situ, unless it formed very quickly. Is that correct? Do you have a not to technical reference I can read to educate myself on this? The cores of Jupiter mass planets don’t seem to have cores like terrestrial planets like ours, but once stripped of the gaseous material the core may settle down to a dense differentiated state of rock and metals. I am saying it does not matter if the gas giant forms near the star or far away form it or where it forms, so it can’t have a liquid hydrogen core. All gas giants have to begin with a solid, rocky core according to planetary science. Brown dwarfs have the metallic hydrogen their cores due to the pressure ionization.